There are many Indochine restaurants that sprawl the globe these days, yet no Vietnamese food abroad can equal the flavor or quality of the cuisine created in Vietnam itself. Vietnamese cuisine though not terribly rich nor heavy, like take for example Northern Indian cuisine, actually has many starchy attributes that stem from the “eat rice” culture evident in the many paddy fields throughout their country. Depending on the type of holiday you choose or how you choose to dine in Vietnam, you could have anything from a simple meal to the most complex of dishes, fit for a King. 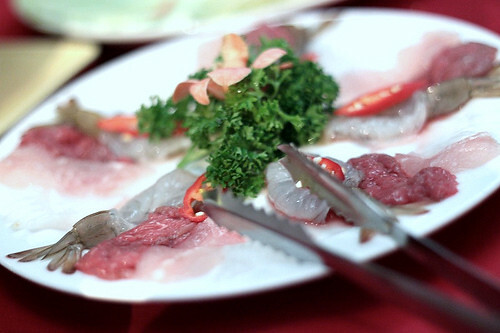 Ho Chi Minh City is a great place to experience this sort of spectrum dining in Vietnamese cuisine. Having said that, no matter rich or poor, extravagant or humble, the typical Vietnamese meal usually consists of a balance in herbs and meats, and a subtle employment of Asian spices to reach a fine taste. 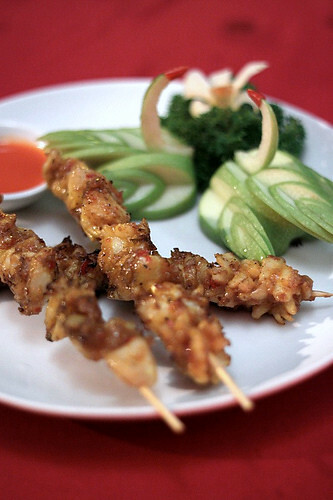 Vietnamese food can be considered one of the healthiest, most tasty and most accepted Asian sort of cuisine worldwide. 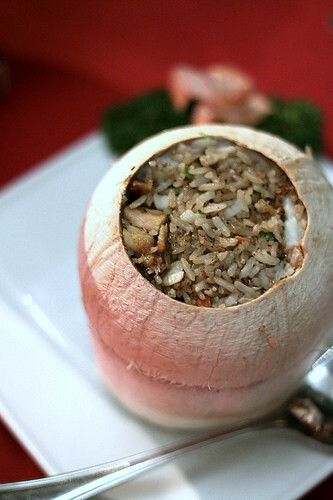 Stewed Fish in Young Coconut. Influenced by the Chinese, chopsticks and spoons are used in Vietnam as opposed to fork and knives. 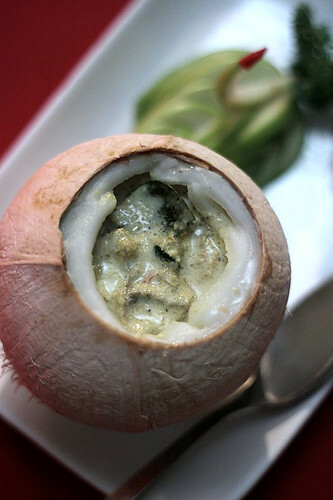 Many desserts are wrapped in banana or coconut leaves and food such as curries rich in coconut cream, are sometimes served up in the coconut shell itself. One place that holds true to these interesting dining customs is a cozy little restaurant in Desa Sri Hartamas, known as Exotic. This place serves a nice mix of Cambodian, Thai but mainly Vietnamese Cuisine. 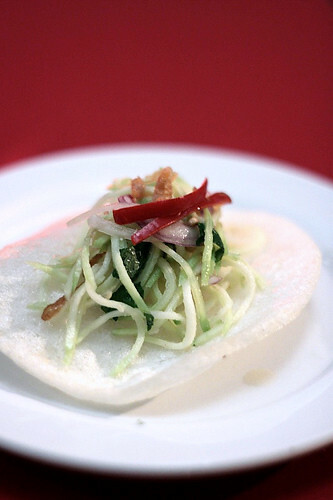 My absolute favourite and a great gauge if a restaurant is authentically Vietnamese or just rubbish-ing you, is the Banh Xeo. 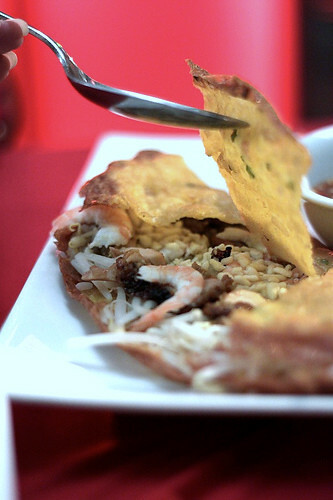 Banh Xeo (literally sizzling cake) are Vietnamese savoury pancakes made out of rice flour, water, turmeric powder, and sometimes coconut milk (in the Southern regions), stuffed with slivers of meat, shrimp, and bean sprouts and then pan fried. Traditionally, they are served wrapped in mustard leaf, lettuce leaves, and stuffed with mint leaves, basil and/or other herbs, and dipped in that yummy sauce called Nuoc cham (Vietnamese fish sauce thinned with water and lemon). I love the one at Exotic. They give you loads of ingredients.. almost too much. But that, is a good thing. A Combination platter, of Prawn Crackers, Fresh Prawn Roll, Fried Spring Roll (Cha Gio), Thai Fish Cake, Thai Treasure Bag, Mango Salad. I love the Cha Gio best in the combination platter which is essentially the deep fried version of the Vietnamese Summer Roll (see below). This golden crispy spring roll is meat, sometimes even yam, crab or shrimp, rice vermicelli all wrapped up in one compact, juicy, crunchy roll. Very good. 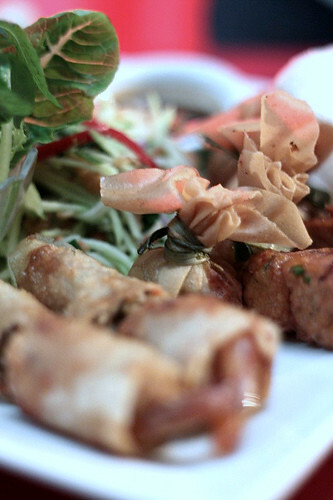 Summer weather in Kuala Lumpur calls for Summer Rolls! 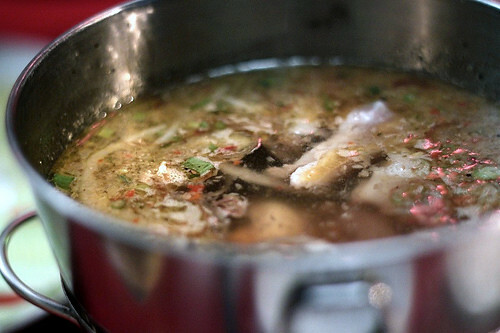 Step 2 – Dunk meat into the vinegar broth and cook for a long period of time to makes sure any living microbes are dead and to make sure your raw meat is cooked properly. As the platter consists of mixed meats (seafood included) I suggest you cook the meats for a LONG time. 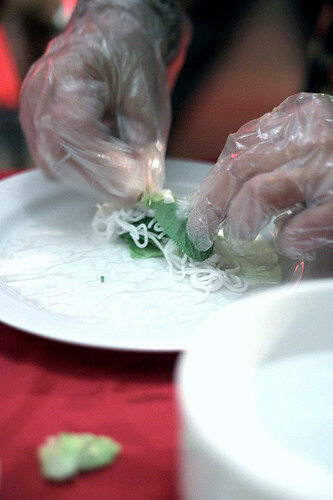 Step 3 – Roll up your cooked meats, mint leaves, basil leaves, rice vermicelli gingerly into the perfect roll. If you have two left thumbs , pass it to A lil Fat Monkey who is the KING of the roll! Goi Cuon (Summer Roll) – They are rice paper rolls that often include meat, shrimp, herbs, rice vermicelli and other ingredients wrapped up and dipped in nuoc cham or peanut sauce. In this case, it was really rather creatively done, where we wrapped our own rolls after cooking the contents by dipping it in a hot-pot stock. A lil fat monkey was the best at this. Yes, he really is good with his hands. Meat on Sticks.. because it’s fun! 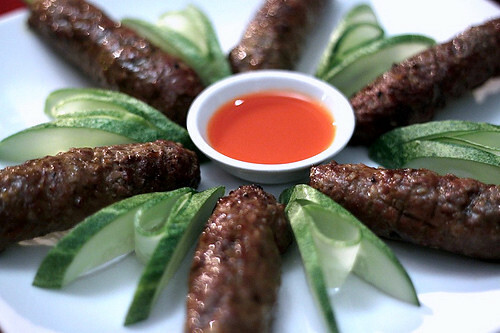 Vietnamese Satay- Minced Beef Skewered on Lemongrass Stalks. Exotic does fantastic meat on sticks too. I don’t know if it will be reproducibly good but when we were there, it damn near knocked our socks off. Sweets for the Sweet.. sugar for my honey. 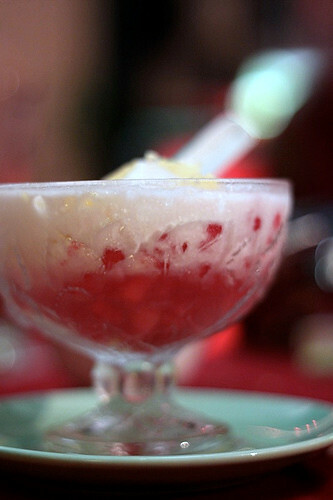 Suong Sa Hat Luu- Pink/red tapioca pearl with jello in syrup and coconut milk, served with ice. Great for hot weather! *All photos courtesy of A Lil Fat Monkey. The man with the magic rolling hands. I was surprised to read that the Vietnamese are not big on desserts. They generally prefer fresh fruits. All I can say is that for a race that prefers fresh fruit, they sure know how to make the sweetest most richest desserts on the block! 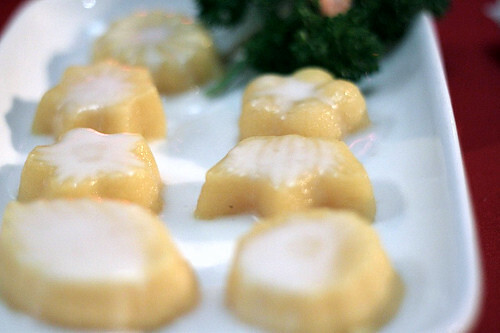 Pink/red tapioca pearl with jello in syrup and coconut milk, sweet cakes, tapioca cakes and sugary sweet banana fritters are amongst the specialty desserts they serve at Exotic. Look closer and I am sure you will see colored glutinous rice in sweet bean paste and other sweet cakes on the menu. 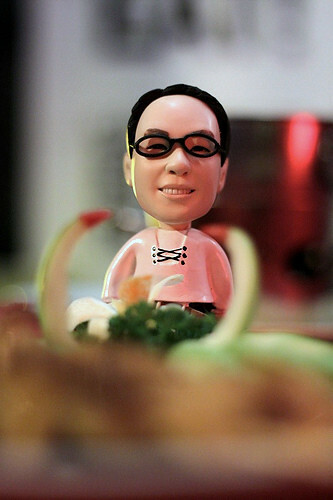 That concludes this wonderful food review at Exotic. Thank you Jess Lew for the invitation to dinner at your fine restaurant, via Frat Mustard of The Q-guides. If you guys have not already heard about The Q-guides, you should check them out , ASAP. Desa Sri Hartmas, Kuala Lumpur. so documentary like one your review..refreshing! so glad my pics helped you to create a such a wonderful post. Love the whole traveljournalism thing going on. Looks like a lot of delicious food here. I work at a thai/chinese restaurant in Chicago. You will have to check it out when you come next year. The concept of putting stuff into young coconuts – very nice, presentation wise. yar, it does sound like a documentary…. all you need now is to get david attenborough to narrate…. Chis…such rave reviews and I haven’t been there yet. Take me there, ciki!! FASTER! (but we must book thru theQguides, ok!) hehe.